Suited for large and small contractors, MSP 455 is powered by 40 hp, air-cooled, gasoline engine andÂ incorporates heavy-duty gearboxes and spiders, hydraulic power steering with independent manual pitch controls, and torque converter clutch system. Raised operator platform and hydraulic joystick positioningÂ promote ergonomics, while two 46 in. dia, 5-blade, non-overlapping rotors operate at speeds up to 165 rpm. For application of retardant, electric-powered spray system is included. 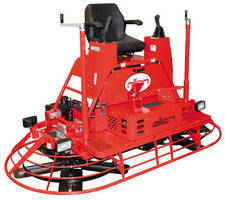 The Allen MSP 455 is a totally new Power-Steering, Mechanical-Drive Riding Trowel in the Allen riding trowel line-up. The powerful gas engine, Super Heavy-Duty Gearboxes and Spiders combined with a Torque Convertor Clutch provides a great weight-to-horsepower performer for large and small contractors. The raised operator platform and the hydraulic joystick positioning makes this one of the most ergonomically designed riding trowels on the market. The MSP 455 is the latest addition to Allen’s Mechanical Super Pro (MSP) Series of Riders. • Flip-up seat and removable screens for superior accessibility to engine, torque convertor and drive-line. The MSP455 Riding Trowel will be on display in our stand at the Bauma International Trade Fair in Munich, Germany from April 15 – 21, 2013. Allen will be located at stand # 902A/5 in the open air area. Ab lindec is the Allen Master Distributor in Europe and will be Co-Exhibiting with Allen Engineeering at Bauma. Allen Engineering Corporation (AEC) is headquartered in Paragould, Arkansas USA. The company designs, engineers, manufactures, and markets equipment for concrete placing, finishing, and paving professionals with a number one goal of Total Customer Satisfaction. Allen Engineering Corporation is family-owned and their Allen Equipment is American-Made. Allen Equipment is sold through a network of “concrete-focused” dealers around the world. For more information, visit the AEC web site at www.alleneng.com.